Ministers try so hard to keep everything under control that they often miss the fun of it. When church leaders feel frustrated, there’s a better option than giving up or giving in. They can open their eyes to a new perspective and cultivate a life shaped by Christ’s joy. 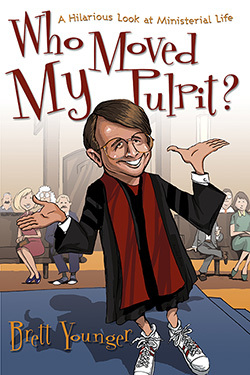 Who Moved My Pulpit? is a humorous look at almost everything ministerial. Younger invites us to laugh at the ridiculous and celebrate the holy. This look at everything from pastor search committees (“Does this swimsuit make my hips look big?”) to church answering machines “The Lord be with you, but I’m in a meeting”) is for everyone who wants to remember the love that led them to church in the first place. Brett Younger is the Senior Pastor of Broadway Baptist Church, Fort Worth, Texas, where the pulpit is too heavy to move. He learned lots of what’s ministerial from Baylor University (BA) and Southern Baptist Theological Seminary (MDiv, PhD). He and his wife, Carol, live an amusing life with their children, Graham and Caleb. Exactly Why Did the Last Pastor Leave?